Now for something completely different! Our suggestion today is the Boxer Brief Shape Fitting Underwear by Stiffies. It is a new design by the Australian brand Stiffies which prides for their the highest quality fabric and workmanship. 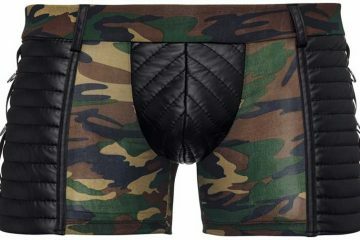 This underwear gives the wearer greater comfort especially when playing sport, and disguises potentially embarrassing erections by keeping it tucked into the side pocket when aroused. The Pocket is designed to fit many shapes and sizes, regardless of waist band dimensions. Fabric: 92% Cotton 8% Spandex. Available sizes: S (27-31) M (31-35) L (35-39) XL (39-43). Colour: Red.